Destination Uruguay! And let’s go straight to dessert with chajà. 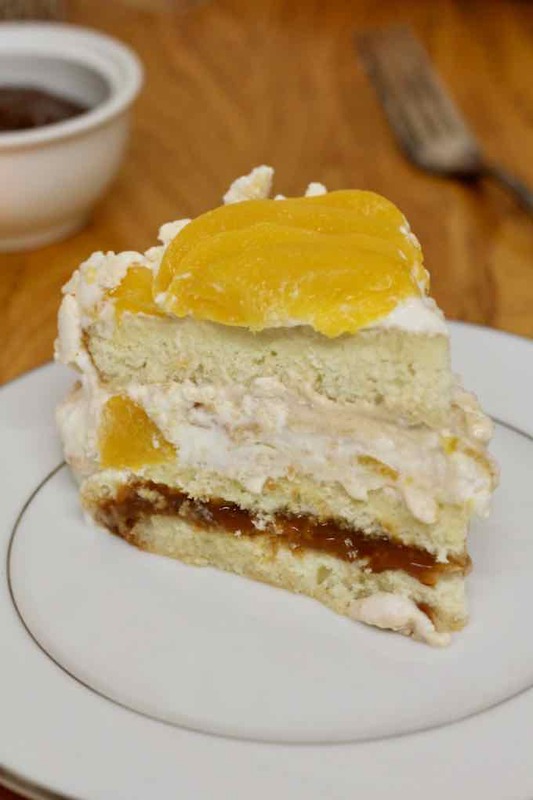 Chajá is a Uruguayan cake that consists of 3 layers of sponge cake stuffed with syrup, dulce de leche and a delicious whipped cream. What is the origin of chajá? 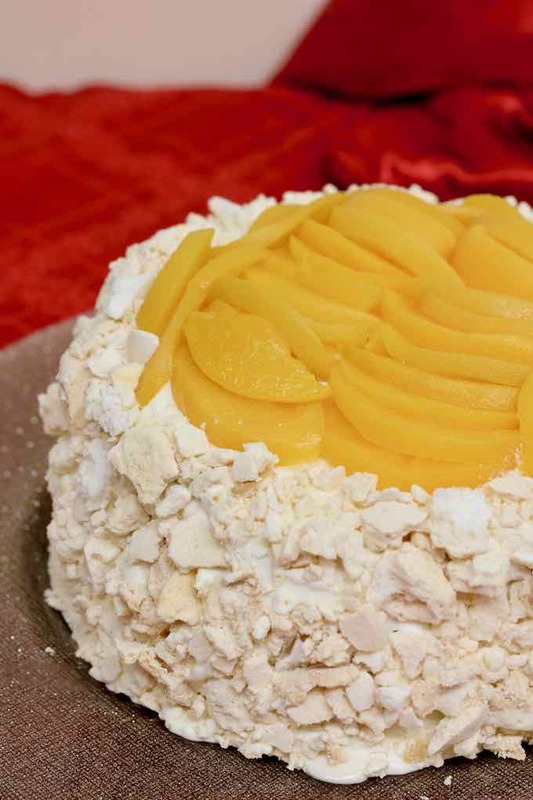 Postre chajá (or chajá cake) was invented by Orlando Castellano, owner of the pastry shop Las Familias, in the city of Paysandú. Paysandú is the capital of the department of Escudo. It is one of the main cities in Uruguay, with 75,000 inhabitants. The name of this cake was inspired by an Aboriginal term designating a typical bird of the region. This bird, the chajá, could be chosen as the emblem of the “Southern Cone”, which defines the southernmost zone of the South American continent. It looks like a kind of turkey, with a crest, a small pointed beak and feathers around the neck. It is often found freely roaming in the regions of Uruguay, southern Brazil, northern Argentina, Bolivia, Paraguay and sometimes southern Peru. The chajá bird has a massive appearance and a very thick plumage. However, it is very light because of its hollow bones and it reaches only eight pounds as an adult. The chajá is a bird that could be described as friendly because it can be domesticated easily. Although it seems powerful and imposing, it is totally harmless to humans, unlike some species of raptors found in the region. The chajá is an intelligent and altruistic bird. Indeed, some natives have reported cases where chajás adopted orphaned birds like their own children. Chajás are also monogamous and faithful until their death. Perhaps that is the reason why the Uruguayans are so loyal to them. However, although chajás are full of virtues and benevolence, they have their character. If they feel that their protégés are threatened, they do not hesitate to attack their formidable opponents to defend them with their beaks and claws. Raptors, weasels and even cats, beware! But let’s go back to our cake! The chajá cake is like the bird: massive in appearance, but so light once you have tasted it. You could eat a huge amount without realizing it, or feeling heavy. 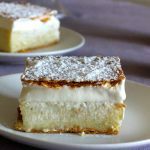 Its lightness is based on the smoothness of the whipped cream and the thin layers of spongy sponge cake. Its volume is conferred by pieces of meringues that are crumbled to cover the cake. Traditionally, this cake is made with peaches but it is not uncommon to find versions garnished with strawberries. Be sure to beat the whipped cream enough so that it is sufficiently compact. If you do not whip it enough, it may run down the sides of the cake, and as the peaches release some syrup, the cake may collapse. The pavlova is very close to the chajá in its composition. 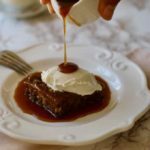 It is a dessert created in the 1920s. It consists of crispy meringue and fresh fruits. It was named in honor of the Russian ballerina Anna Pavlova. 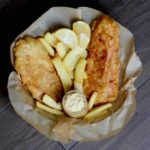 Its specificity is to be crisp on the outside and soft on the inside. 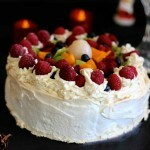 The pavlova is usually topped with whipped cream (or ice cream) and covered with fresh fruits. However, it does not contain layers of sponge like in chajá. 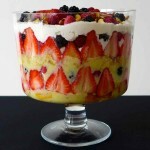 This dessert is very popular in Australia and New Zealand, following a tour of Anna Pavlova in both countries. 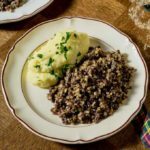 It is an important pillar of the gastronomy of this region where it is associated with summer occasions, including the traditional Christmas meal. The fraisier (strawberry shortcake) is also a cousin of the chajá, although it does not contain dulce de leche. 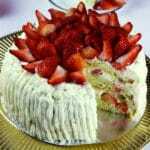 It consists of strawberries, layers of sponge cake, pastry cream and a thin layer of almond paste. The Swedish version of the fraisier is even closer to the chajá than the French version. It is called midsommartårta or jordgubbstårta, a layer cake consisting of layers of sponge cake, strawberries and whipped cream. It is often consumed in Sweden during the celebrations of the summer solstice (Midsommar). We hope you enjoy the chajá. It is a cake that combines lightness and contrast in textures. 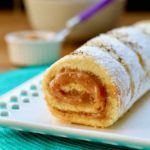 The combination of peaches with syrup and dulce de leche is simply divine! 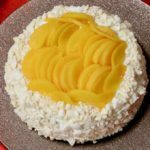 Chajá is a deliciously light dessert typical of Uruguayan cuisine, consisting of meringue, sponge cake, whipped cream and syrup peaches. In the bowl of a stand mixer, beat the eggs and the caster sugar at high speed until they whiten and triple in volume. Add the sifted flour and, using the flat beater, mix at low speed for 30 seconds. 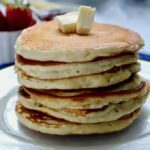 Grease an 8-inch round cake pan with high edges and sprinkle with flour. Tilt the pan and turn the pan on itself get rid of the excess flour. Pour the batter into the mold and bake for 12 minutes at 400 F, then lower the temperature to 350 F and bake for another 30 minutes. Remove the cake from the oven and wait about 10 minutes before unmolding. Preheat the oven to 210 F.
Using a large black pen, trace a circle of the same size as the sponge pan (8 inches) on a parchment paper, turn it over and place it on a baking sheet. Add the egg whites into the bowl of a stand mixer. Add a pinch of salt over the egg whites and beat them. When the mixture begins to foam, add the caster sugar gradually. Once the whites are stiff and shiny, stop whipping and fold in the icing sugar delicately with a spatula, without breaking the egg whites. Using a pastry bag and a large plain pastry tube, pipe the meringue in a circular motion, so that it fills the circle painted on the parchment paper on a single layer. With the rest of the meringue, make some meringues discs. 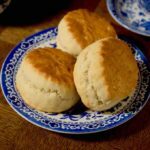 Bake for two hours at 210 F.
After two hours of baking, increase the oven temperature to 270 F and bake for another 5 minutes. Turn off the oven and leave the meringues inside until they cool completely. Place the heavy whipping cream in the freezer for 20 minutes. Pour the cream into the bowl of a stand mixer. Beat the whipped cream at medium speed for about 10 minutes by incorporating the icing sugar gradually. Drain the peach halves and reserve their syrup in a bowl. Slice 4 halved peaches (to cover the top of the cake) and cut the remaining peaches in small cubes. 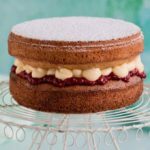 Slice the sponge cake in 3 equal layers. Place the first layer of sponge cake in a 12-inch pie dish. Brush the first layer of sponge cake with the reserved peach syrup. Then spread the dulce de leche with a spatula. Place the second layer of sponge cake and brush it with the syrup. Cover with a generous layer of whipped cream. Cover the whipped cream with half of the diced peaches. Place the meringue disk on the peaches and press lightly. Cover again with whipped cream and place the rest of the diced peaches on top. Place the third layer of sponge cake on top and press lightly so all the fillings get compacted. Cover all the surface of the cake with whipped cream. Break the small circles of meringues and carefully glue them on all sides of the cake. 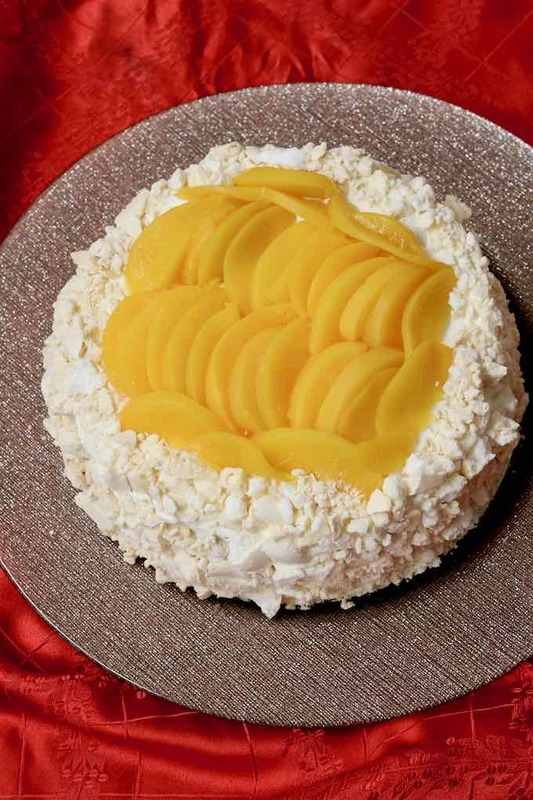 Arrange the sliced peaches carefully on the surface of the cake. Pipe all the remaining cream with a pastry bag with a fluted tip to draw a tube around the top of the cake. Refrigerate the chajá for at least 6 hours before serving. 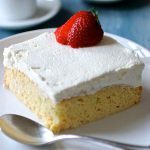 It is best to prepare the sponge cake and the meringue the day before, or two days before, and to cut the sponge cake just before assembling the chajá. It is important to refrigerate the cake before serving.